Spinal cord stimulation (SCS) from Integrated Pain Consultants is safe to use on a variety of back pain, neck pain, joint pain, nerve pain, knee pain or another type of pain, conditions. When other pain treatments have failed, spinal cord stimulation may be an option. Contact Dr. Nikesh Seth and the team at Integrated Pain Consultants to get started today. Spinal cord stimulation is a procedure that uses an electrical current to treat chronic pain. While spinal cord stimulation is Bluetooth wireless leading-edge technology, it’s actually not as complicated as it seems. Your nerves and brain are constantly communicating with each other. When you feel pain, it’s because those nerves are sending a pain signal to your brain. Spinal cord stimulators block this signal pathway resulting in less pain and more living for you. If you’re seeking help for pain management, please contact one of Integrated Pain Consultants’ three offices to schedule a detailed evaluation – (480) 626-2552 or book your appointment online today. Spinal cord stimulation, or neurostimulation, sends a series of electrical pulses or signals to the spinal cord which interferes with and thereby reduces any pain signals you have in that area. Initially, you’ll be evaluated to see if you’re an ideal candidate for spinal cord stimulation. During an outpatient trial of 5-7 days, Integrated Pain Consultants will implant a temporary electrode through the skin to see if stimulation can alleviate your pain. Similar to an epidural injection, this procedure differs in that instead of putting steroid into the epidural space, a small wire electrode is placed instead. The spinal stimulator lead is a soft, insulated wire with electrical leads. A needle is used to guide this wire, about the size of a human hair, into the epidural space. This procedure is performed with the fluoroscopic guidance of a live X-ray to help accurately target and place the device during your procedure. An attached stimulating device sends the pulses to interfere with the pain signaling pathway. Instead of pain, most patients experience a mild tingling sensation. If the procedure actually reduces your pain, Integrated Pain Consultants can implant a permanent pulse generator under your skin in a short outpatient surgery. In our commitment to provide the best options for patients, we use spinal cord stimulators with wireless devices to control the implant. 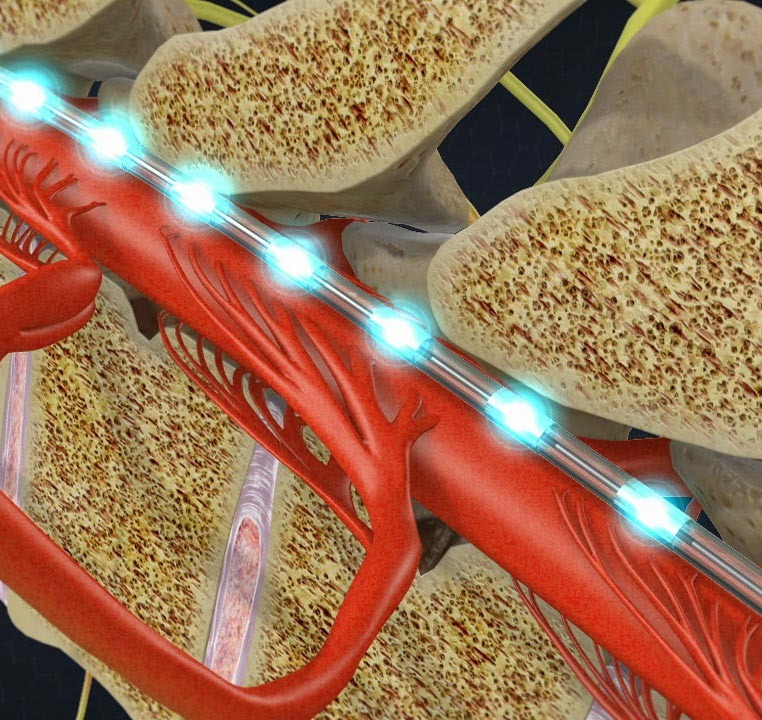 Spinal cord stimulation is a cutting edge technology that works with a wireless device. This provides a high level of comfort for the patient without the need for medication-based side effects. If you are suffering from chronic or acute pain and need relief, please contact Integrated Pain Consultants and let’s talk about a pain management treatment plan that is right for you. You just might be a good candidate for spinal cord stimulation. With three offices open in Scottsdale, Mesa, and Phoenix, Arizona, learn why we are voted “Top Doc” by Phoenix Magazine and read reviews left by other patients of Dr. Nikesh Seth and his amazing team of physicians and providers. Learn more about pain conditions, pain treatment, and please schedule your appointment by calling (480) 626-2552 or book your appointment online today.